Decisiveness is considered a valuable and necessary quality in contemporary society, and it has probably always been that way. One of early man’s essential survival skills was his ability to think quickly and act decisively under pressure, using his weapons, his physical fitness, his powers of observation and his cunning. Decisiveness is directly related to confidence and power, qualities of the healthy masculine archetype. I have heard many times that making the right decision is often not so important as making any informed decision, then committing to it fully and following it through. I have made major changes at different time of my life, and having made a decision over something big, I have been able to commit and not look back. But usually it has been carried out after months of anxiety and silent deliberation stemming from not knowing clearly enough. Having crossed the bridge, I have had a tendency to run away from the old situation, without proper resolution or completion. From the beginning not-knowing has been my familiar state. As a dreamy, artistic piscean it comes naturally to me to be able to float and flow in a watery reality. A reality that has also been a constant challenge to the more rational aspects of my character. During childhood my parents were uncomfortable with my dreaminess; worried, I guess, about my safety as I got older and began to do things independently of them, such that they wanted to know that I could look after myself. They probably projected on me their own fears and lack of street-wise savvy. This situation played a significant part in my parents’ decision to send me to boarding school at the age of eight, where my education would ensure I could become a rational, disciplined, responsible model of manhood, ready to thrive in a harsh adult world that required confidence and clear precise decision-making. They wanted the best for me, and up to a point this patriarchal education impacted on me in positive ways. I did develop a rational mind. But the stressful nature of life in an all-male boarding school in the 1960s also distanced me from the sensitive boy I had been. It toughened me up in the sense that it limited my ability to feel pain and therefore pleasure too. I lived in fear a lot of the time, and I developed ways to stay safe by fitting in, not challenging things I did not understand or disagree with, becoming compliant and easy-going to manage it all. I also developed an ability to rise above my circumstances. It was a form of dissociation, but it also had a quality of spiritual transcendence that I came into this world with and which I treasured secretly in the profane environment of school. More on this later. Sometimes being this way left me not knowing in circumstances where I felt lost, even in danger. Situations when I became a victim to others’ ability to take charge and dominate me, when I was unable to step away and make clear decisions to protect my integrity, my autonomy and my welfare. This dynamic has followed me through life and I have actually made positive use of it; but I also lost other important aspects of being a rounded personality: my ability to speak out on behalf of myself and others, my ability to feel and express anger, outrage, heartfelt passion and compassion. I have failed to surrender fully in relationship, unable to love deeply and unconditionally. In childhood I had created the feeling of living with a wall of protection around myself that kept me safe but separate, protected but often not able to see enough of what was going on outside my castle walls. As I have got older, I have at least found a door to the outside world, but inside my castle walls I can remain vague and hidden, I can avoid having to take a stand on things, make decisions that would require me to step up and take responsibility. In this state it remains easier to hold back and let other people around me assess situations, take the initiative and risk the consequences, so that I don’t have to. I have feared getting it wrong through not knowing enough, not being able to see what is required, and make poor or wrong decisions. I have preferred to live and stay small, rather than take the risk of being decisive and in doing so, failing or leaving myself exposed. 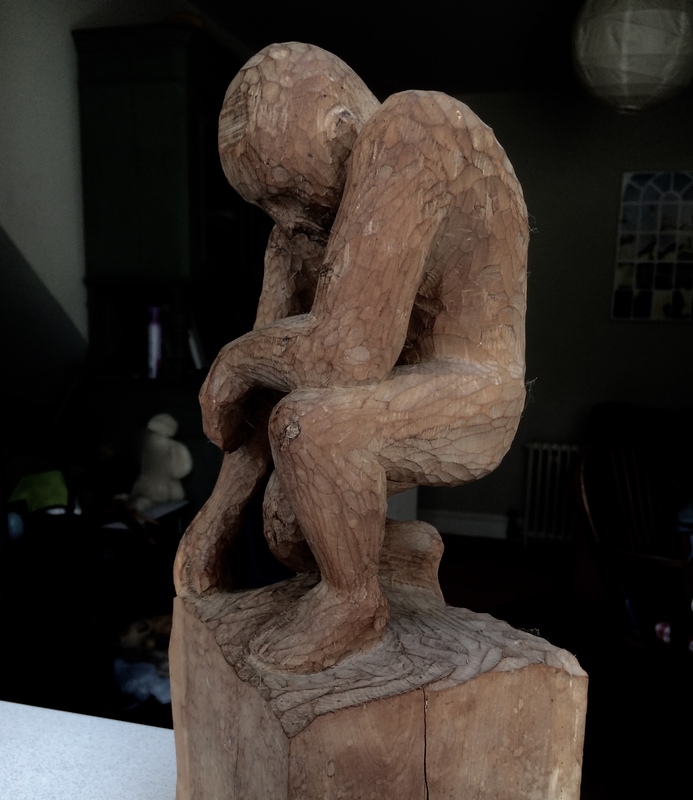 A male figure I carved in my twenties that shows his potential power and yet he is humble and submissive in kneeling to a greater power. In spite of all this, I have come to see how much life experience combined with the variety of skills I have developed, have put me in a position with others, especially younger people, where I do realise I know more, see more clearly with a wider view, or offer a more efficient way to go about things. Out of my wounded self, I have developed a quiet wisdom and a still presence that people often appreciate. I see people around me making mistakes on a regular basis. I can see it is normal to be able to acknowledge failure, admit the error, apologise to others if necessary and then smoothly move on to the next decision. But something inside me resists responding in this way. Something or someone insists that I have to get things right or not go there at all. Better to stay silent, because to get something wrong is somehow shameful and humiliating. On top of this, I am not allowed to change my mind, to change my decision. Once announced, I have to stick with my pronouncement whatever the cost. This is nonsense of course, and I can only assume that it is a very young, immature self in me who operates by these simplistic rules. It is also, of course, the root of stubborn pride which is an inculturated distortion of the masculine. There is the confusion of being ‘left behind’, not knowing what is going on or what is expected, with a vague but genuine sense of danger around daring to ask, which then creates a sense of being trapped in a world of isolated unknowing and an accompanying risk of making mistakes. Then there is the not knowing of convenience, where ignorance is preferable, so that we can feel justified in not being able to come forward with a clear opinion or decision about something. Sitting on the fence, staying safe, even though it leads to disempowerment. On the other hand there is the more positive aspect of being able to be with not knowing, in order to hold paradox, or to tune in to people and situations in a more intuitive way. It is a feminine quality as opposed to the more masculine quality of decisiveness. This aspect needs expanding, as it is an important part of the picture. As young children we all have the ability to tune in and sense what is going on, without knowing the facts of a situation. It is our unconscious instinct for survival. I have remained open to this channel, as many of us do into our adult years, often sensing what is going on in situations without being aware of it consciously. This is another aspect of how we instinctively keep ourselves safe of course, but in other ways too. It is the basis of our ability to feel compassion, to know what others are feeling or needing in the moment. Reading energy is a valuable and necessary skill in therapeutic situations and I use this ability in my work as a counsellor. We are moving into very uncertain times in every aspect of life. It shows up in politics, job security, the damage to the environment, weather patterns, health etc. It is as if the very planetary systems are in trauma as a result of human greed and ignorance. The planet’s trauma, which is revealing itself now in so many ways, is a reflection of our individual disfunction and pain, and leaves us exposed to unpredictable change. It is a known fact that the most distressing aspects of the trauma suffered by people with PTSD is the uncertainty of their predicament. In order for the planet to heal, it is vital that we own and address our personal traumas. Uncertainty about the future makes us less capable of coping with negative events when they happen and disables us from taking efficient and effective steps to avoid them in our helplessness. Uncertainty is often a major feature of the ‘dark night of the soul’. The great mystics of all traditions who have survived this terrible journey tell us that, faced with a dark night, we have only one resource: to remain in a state of radical unknowing. This will have two effects; it will crucify the ego’s perpetual hunger for certainty, and it will open us with humility to the guidance that can only come when we are willing to surrender to a higher power, with no preconceptions. I find it difficult to trust and surrender in many situations, but there have been times in my life when I feel stuck without enough information or confidence to make a big decision. Yet, once I have surrendered to the waiting and not-knowing in which I find myself, a clear sense of direction has come to me as an inner knowing of what is right for my soul’s path, sometimes difficult and painful to follow, but always bringing a sense of relief and rightness. There are still many situations where the demand to respond in the moment, to step up, to risk being at odds with someone, will leave me paralysed, dumb struck, literally unable to speak, in a panic of irrational fear left over from childhood. But when I am able to back up my sense of clarity on something, where I can see I have more experience, knowledge or wisdom, and I do speak my truth or give my advice in a decisive way, I feel more clearly seen by others, more empowered, more honoured, as I assert my place in the world through what is revealed, whether it is attributable to my practical skills, my aesthetic taste, my rational brain, my mystical beliefs, my values, or my wisdom. I have reached the stage of my life in which struggling to find meaning and purpose doesn’t have such a grip on me as it used to and I come back to enjoying the simpler things, living in the moment. Writer Joan Tollifson calls it ‘living in groundlessness’. She says: “here-now we always are, and right here, there is the utter simplicity and wonder of life itself—the sounds of rain, the freshness of the air, the ache of grief, the taste and texture of this moment, just exactly as it is. And it never stays the same, for everything is always changing. The universe literally begins anew in each moment. And really, this moment is all we have….. “ She describes how she has given up her search to avoid groundlessness, uncertainty, vulnerability, lack of control, and the reality of not knowing, in a kind of surrender to WHAT IS, that brings a simpler but more complete kind of satisfaction and contentment. I am coming to realise the quality and benefits of not knowing in this simple and yet profound sense. Can we ever know and understand the complexities and mysteries of life, of other people, of ourselves? Only by surrendering to the un-knowing can we hope to touch the wonder and beauty of all that is. This entry was posted in Articles by me and tagged Decisiveness, No-knowing, Uncertainty. Bookmark the permalink.